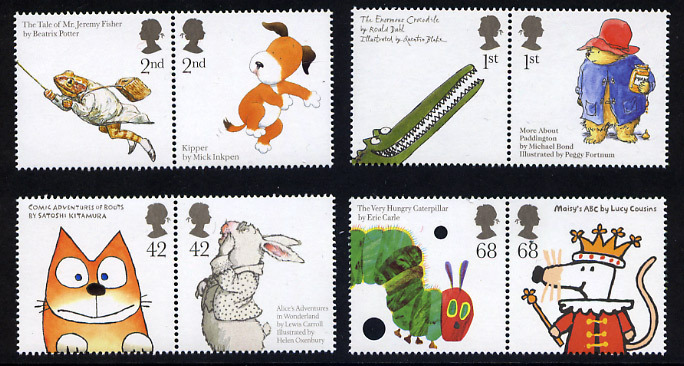 Great Britain stamps - Animal Tales: Illustrations from Children's Literature - Joint issue with USA - 10 January 2006 - from Norvic Philatelics. 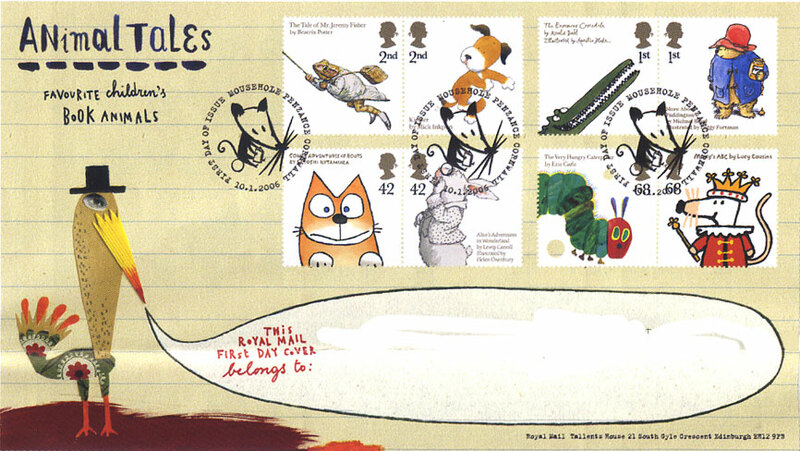 This is a joint issue with USPS, but only 2 stamps, The Very Hungry Caterpillar and Maisy, will feature in both the Royal Mail and the USPS stamp issue. There will be an official joint FDC (shown below) featuring these stamps, and we will produce pairs of covers with all 16 stamps from both countries, each cover having 4 stamps from each country. It’s 100 years since Beatrix Potter’s Jeremy Fisher first leapt into children’s lives, but the amphibious fisherman is just one of many enchanting animal creations who have found their way onto the bookshelves of millions of homes. Animal Tales celebrates the enduring popularity and universal appeal of illustrated children’s books from both sides of the Atlantic in a special joint issue with the United States Postal Service (USPS). Both postal administrations chose seven home-grown books, plus an eighth from ‘across the pond’. The British stamps are issued in four se-tenant pairs. From the American selection Royal Mail selected Eric Carle’s The Very Hungry Caterpillar, whose insatiable appetite has nibbled its way into 20 million homes worldwide. 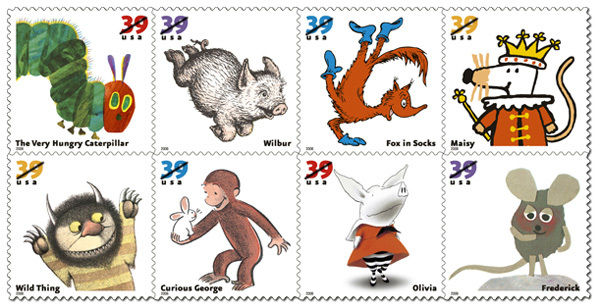 Fittingly, he has already taken bites out of the 68p stamp he appears on next to Maisy, Lucy Cousins’ lovable mouse, who was chosen to appear on the USPS issue. 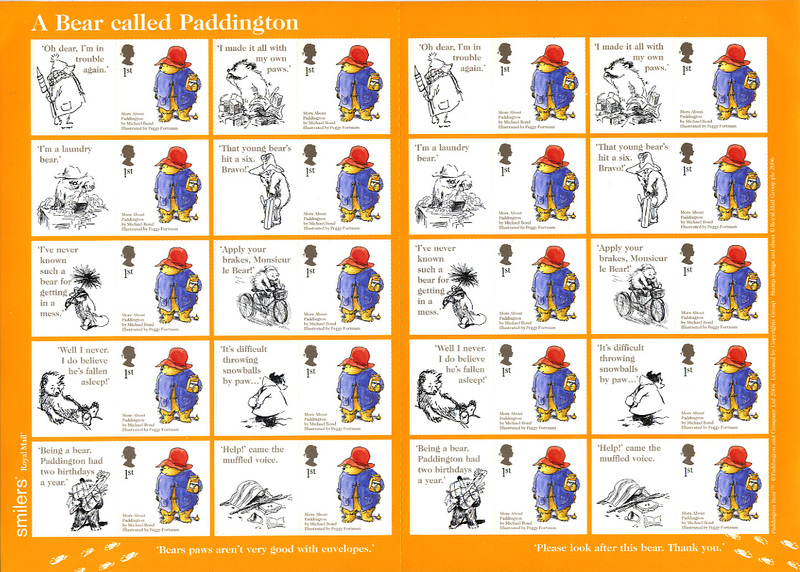 1st class - Paddington Bear™ by Michael Bond, illustrated by Peggy Fortnum © Paddington and Company Ltd 2006. Licensed by Copyrights Group. 42p - The White Rabbit from Alice’s Adventures in Wonderland by Lewis Carroll, illustrated by Helen Oxenbury © 1999. Licensed by Walker Books Ltd., London. 68p - Maisy™ Lucy Cousins 2006. Licensed by Copyrights Group. The USPS has announced the subjects and designs for the American issue. 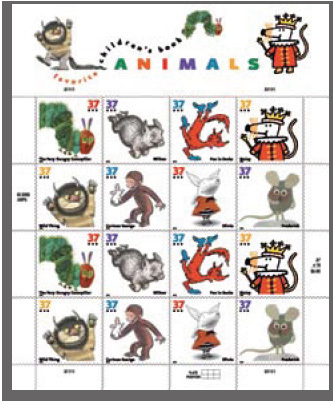 All stamps are shown as 37c but as postage rates will rise in January these will be 39c. The stamps are issued in a self-adhesive sheets of 16 'se-tenant', ie the perforations are interlinked and unlike British self-adhesive stamps, it is not possible to cut a single stamp from a sheet. The First Day of Isssue Ceremony will be at the University of Findlay's Mazza Museum, Gardner Fine Arts Pavilion, Findlay, Ohio. 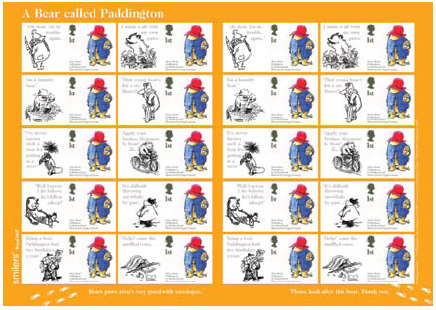 The Paddington Bear 1st class stamp will be issued in a self-adhesive Smilers Sheet of 20 stamps with labels featuring classic illustrations of Paddington from the original books. Click on the sheet to see a larger image. Smilers are printed in litho. This is said to be by DLR as well, though Smilers are usually printed by Walsall SP or their subsidiary Cartor. Images of British stamps and postmarks are Copyright 2005/06 by Royal Mail. Images of US stamps/postmarks are from and are Copyright 2005/06 by United States Postal Service. First Day Covers - see this page - some are sold out but many are still in stock. Ref R1J. Set of 8 GB stamps with any available postmark, and set of 8 US stamps with standard USPS postmark on pair of Royal Mail fdcs - Price £9.50. Any postmark on plain c6 envelope with stamp of your choice Price £1.20 plus cost of stamp; discounts available. The special postmarks available on the Day of Issue are shown here. This may be all; the next Postark Bulletin is due on January 6th, just 4 days before the stamps are issued. 9885 - Inkpen: village, and name of author; 9886, 9887, 9888 Paddington (station) after which the Bear was named. 9895 - Daresbury, birthplace of author Lewis Carroll; 9897 - Near Sawrey, first home of Beatrix Potter; 9900 - Llandaff, birthplace of author Roald Dahl; 9902 - Crocky Trail: see link above. 9883, 9893, 9901 place name loosely associated. Illustrated here is the Royal Mail FDC for the British stamps. The FDCs were designed by Rose Design with illustrations from Sara Fanelli and poems by Roger McGough. 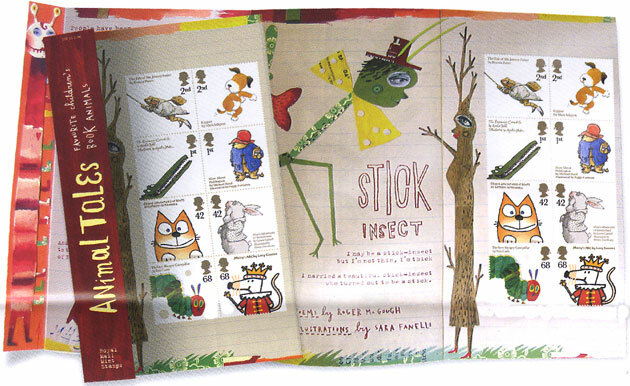 The pack was designed by Rose Design and is fully illustrated by from Sara Fanelli with a narrative by Roger McGough. Previous Joint Issues have featured a Joint Pack: no joint pack has been announced for this issue.